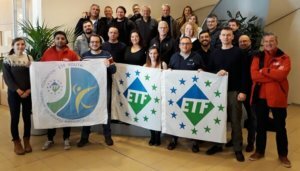 The time had come for ETF dockers and seafarers to gather for the second of their innovative joint trainings! On 20-22 November representatives of 15 unions came to Rotterdam to discuss the trends disrupting the port and shipping industries. They identified and analysed the drivers of change in the global economy, such as digitalisation and the circular economy. It is vital that labour issues are taken into account in during these transitions to new business models, so the aim of the training was to facilitate workers’ engagement in policymaking at national and European level. The training session was part of the joint Dockers-Seafarers project ‘For a strong and more socially sustainable European Maritime Sector’, co-funded by the European Commission and facilitated by industry experts from Port Economics. During the first training in Genoa, participants learnt about the business models and strategies of shipping lines, terminal operators and other relevant players in global logistics. Two upcoming sessions will cover EU and national policies on shipping and maritime (Hamburg) and the role of labour in ports and maritime operations (Lisbon).